Access in this area is restricted. Limited entry for big game tags. 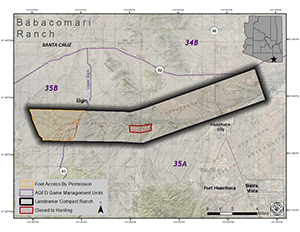 Contact the Babacomari Ranch Manager at 520 455-5507 to participate in access to Babacomari Ranch. 1. All persons must follow Ranch Rules and State Laws and Regulations. Any person who violates Ranch Rules or State Law or Regulation may be subject to trespass charges and immediate cancellation of their access pass or privileges. These violations can result in permanent ineligibility to obtain access preivileges on all Landowner Compact Areas enrolled in the Arizona Game and Fish Department Landowner Compact. These rules apply to all private lands, and public or state lands access by crossing private lands in the Landowner Compact Area. Future access for hunting depends on compliance with these Ranch Rules and State Laws and Regulations. 2. Recreational users who intend to enter and remain on the Babacomari Ranch must posses a valid signed Ranch Rules and Access Agreement form at all times while on the Ranch. 3. All off-road vehicular travel is prohibited on the Ranch. Motorized access is via existing roads only. 4. Hunting is prohibited in the following pastures: Horse, Lyle, East Cienega, and West Cienega. 5. No hunting is allowed within three-quarters of a mile of the Ranch headquarters. 6. Leave gates as they are found. If there is any question, contact a Ranch manager. Respected access is open access.